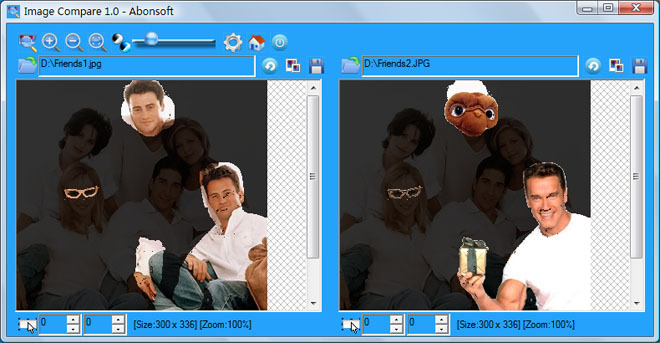 Abonsoft Image Compare can help you to compare any type pictures with their differences highlighted. It also works well for images with different sizes. Just pick up their align point, the software will align the two picture automatically and compare them. The compare result can be in mask mode in two different color, or be highlighted with transparent background. It is very easy to use. ...... It is very easy to use. Qweas is providing links to Abonsoft Image Compare 1.2.111208 as a courtesy, and makes no representations regarding Abonsoft Image Compare or any other applications or any information related thereto. Any questions, complaints or claims regarding this application Abonsoft Image Compare 1.2.111208 must be directed to the appropriate software vendor. You may click the publisher link of Abonsoft Image Compare on the top of this page to get more details about the vendor.